Can the Russian space industry embrace the major reforms needed to bring about successful missions? To mark the 50th anniversary of Yury Gagarin’s first space flight, the year 2011 was declared the Year of Space. It was not the best year for the Russian space industry: There were 32 launches, and four of them failed. This puts the failure rate at 12.5 percent –– only the first years of space exploration in the 1960s saw a higher rate. 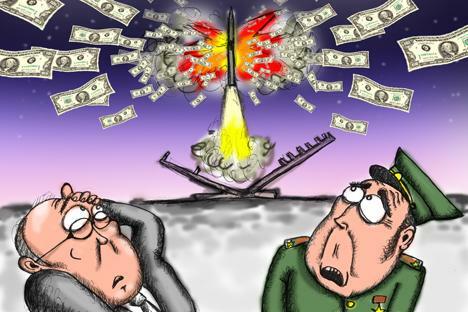 The accidents suggest a systemic crisis in the Russian space industry. Can it be overcome? Thirty-two launches are scheduled for 2012, the same as the previous year. Nearly half of them are mixed projects either involving foreign partners or conducted exclusively on behalf of foreign customers. As for ambitious projects such as interplanetary flights, there are none on the list. However, Russia plans two flights to the moon by 2020, while in the long term, Roskosmos intends to establish a manned base on the moon. For the time being, the launches remain purely pragmatic: tests of a new GLONASS satellite modification, projects ordered by foreign customers, and launches of transport and piloted spacecrafts to the International Space Station. The Phobos-Grunt accident was probably Russia’s most painful space failure last year, and its consequences are much more serious than originally appeared. Launch failures can happen to anyone, but when a project that has been prepared for many years fails at an early stage because of what many specialists believe to be errors, there is good reason to step back and take a serious look at the situation. The problems with the Russian space industry appear even more alarming when it becomes clear that the problem was not caused by insufficient financing. During the past few years, public funding of the space industry has increased, but because there is no single explicit state strategy for the development of the space industry, the money is not spent in the most efficient way. The Russian space industry is based on a production chain that includes hundreds of subcontractors, and reforming it will require radical personnel, management and technical challenges. These reforms will require as much effort as creating the entire space sector from scratch, as happened from the late 1940s through the mid-1960s. The personnel problem deserves a special mention: The shortage of specialists and managers between the ages of 30-50 has become a real scourge for the domestic manufacturing industry, especially the defense sector. Many of these specialists chose to abandon the space industry when they were young due to lack of funding. As a result, a considerable number of enterprises have been faced with a problem of transferring experience from the veterans who remained in the industry to young specialists just out of school. Lazar Kaganovich, the Stalin-era people’s commissar often said: “Every accident has a name and surname!” Even today many are tempted to apply this principle and point to those personally responsible for accidents, instead of making enormous time-consuming efforts to fix the systemic problem. The Soviet Union only managed to create a functional space industry in the early 1960s when it gave up this practice. No one was personally punished for the disaster on Oct. 24, 1960, when the R-16 missile exploded on the launch pad, killing more than 100 people, including Strategic Rocket Forces Marshal Mitrofan Nedelin. By that time, the state commissions had a new system in place, meticulously analyzing each failed or “partially successful” launch in order to detect and eliminate weaknesses in the system rather than to identify and punish the guilty. By the mid-1970s, this approach had allowed the Soviet Union to attain an exceptional launch reliability rate of more than 95 percent. The phrase “point solution” perfectly describes the current state of affairs in the Russian space industry. The decisions that will be made here and now will mold Russian astronautics for decades to come. It can and must be saved by a clearly formulated state strategy for its development, an elaborated timeline to determine the fate of enterprises, a face of cooperation and distribution of responsibility within concrete programs – orbital, lunar, Martian – just as it was done 50 years ago. This plan, if fully implemented, will not have an immediate effect, but in a few years’ time, we will see positive results. On the other hand, the industry may be ruined if we keep looking for scapegoats and pouring in money without a systemic approach. Ilya Kramnik is a military analyst for the Voice of Russia.